This guide explains about Cloud Sync settings. Cloud Sync enables user to view the all the restaurant information like product items, reports, sales activities online. If you do not have an account, user has to first register an account at MobiPos CloudSync. To use this feature, go to Settings -> Cloud Sync. Before turning on Cloud Sync feature, user has to first input and setup all the relevant information. Firstly, insert your Username , Password and Branch Code. Then, if user wishes to use Cloud Loyalty, turn on the switch beside it. Turning on Cloud Loyalty allows you to share customer information across each outlet. Your customer would be able to earn rewards from outlet 1 and redeem it at outlet2. For initial setup, please contact us. 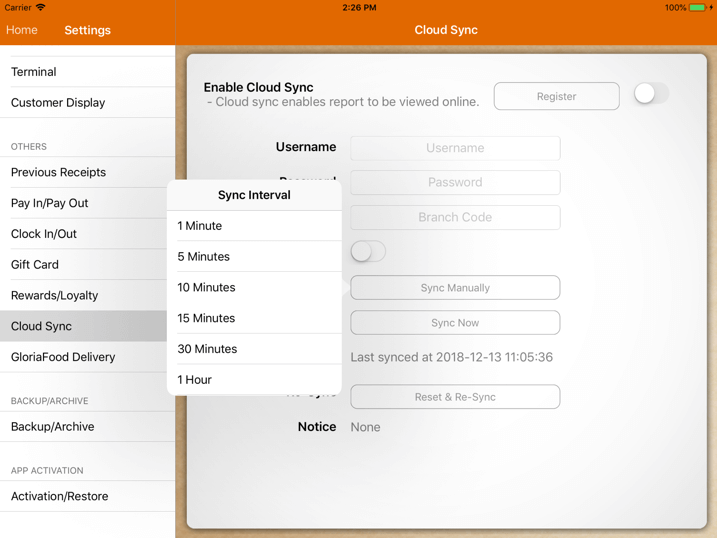 Sync Interval configure the interval to sync to MobiPOS CloudSync automatically. User can choose between 1 minute, 5 minutes, 10 minutes, 15 minutes, 30 minutes, 1 hour or to sync manually as shown below. We encourage user to set their Sync Interval to 1 minute. Do note that using sync manually option, user has to sync the data manually each time. To sync manually, tap on "Sync Now" at Manual Sync section. Manual Sync allows user to sync even if Sync Interval is configured. 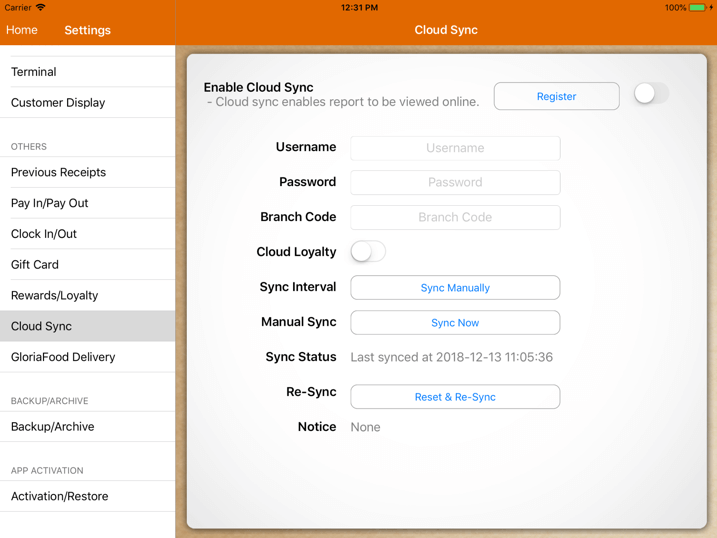 Manual Sync can be used if user has updated the stocks and wishes to update to MobiPOS CloudSync immediately. Sync Status shows the last successful sync date and time. Re-Sync allows user to reset & re-sync. This action clears all the information and setup in the cloud, then replace it with information in this iPad. To Re-Sync, tap on "Reset & Re-Sync" and admin password is required. Notice is shown if there is any announcement regarding Cloud Sync from MobiPOS. Do note that if the switch for Cloud Sync is disabled, no data will be synced to MobiPOS Cloud.